Arizona Poodle Rescue View other Poodles for adoption. GoGo & Lexi are a darling pair of senior gals who are looking for a loving forever home together. 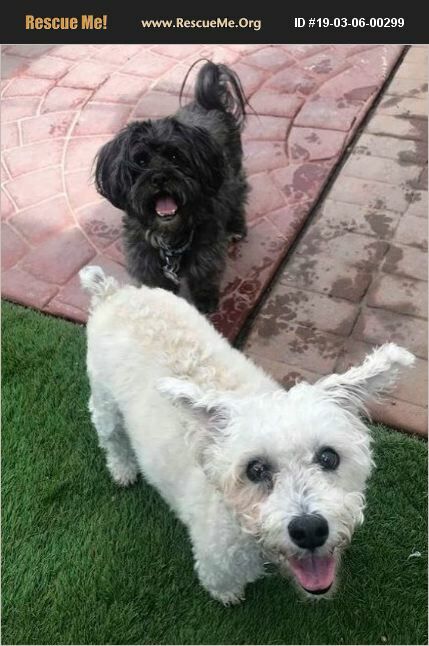 Lexi is a 10 year old black maltese/poodle mix and GoGo is a 13 year old white terrier/poodle mix. Lexi and GoGo are very young at heart and active for their name. GoGo lives up to her name is and is always ready to go & Lexi will happily go right along with her! Both girls are leash trained, good in the car and ready for adventures! Lexi & GoGo do ok with other small dogs with a slow intro, but are mostly happiest just to be together. This sweet pair would do well with gentle, mature children and would love to meet the whole family before adoption. GoGo & Lexi are a well behaved pair of sweet hearts who are both house broken, kennel trained and doggy door trained. They are playful but also love time to cuddle and get affection from their family. Lexi & GoGo both recieved dental cleanings while in our care and GoGo had 6 teeth extracted as well, so they both have pearly white smiles to show off to their new people. Lexi & GoGo love each other, but have lots of love left to give the family who decides to love them forever. Lexi weighs in full grown at 14 pounds and GoGo weighs in at 19 pounds. Both girls are spayed, up to date on shots, microchipped, vet checked and just had dentals. Their adoption fee together as a pair is $450 which includes a free vet visit as well as 30 days each of free pet insurance. To meet Lexi & GoGo please come to our shelter location, 1102 W Hatcher Rd open Tuesday to Sunday 11am-6pm. Please call for location on the weekends as many of our dogs attend off sight adoption events 602-944-2440.